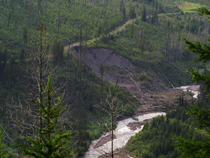 Under a volunteer agreement with the Flathead National Forest, Swan View Coalition has constructed and is maintaining a nature interpretive trail in Krause Basin. The quarter-mile loop trail is located 2.8 miles up Strawberry Lake Road #5390 from Foothill Road. The trail has 12 numbered stations with interpretive information provided via a trail guide brochure available at the trail head. The trail loops through a stand of old-growth western hemlock forest and a regenerating clearcut logged in the 1960s. 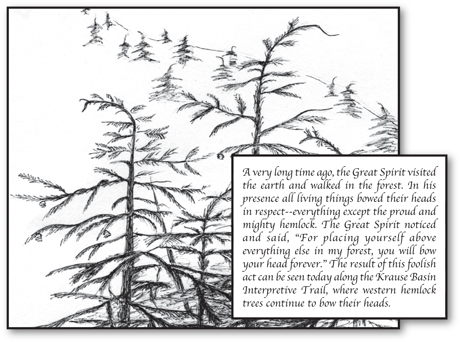 The trail guide provides information on how forests recycle themselves and provide benefits to humans from medicine to lumber. The trail has a compacted gravel surface suitable for baby strollers and wheelchairs. Background In the 1960s, the hemlock forest in Krause Basin was logged for wood products and to establish a different kind of forest preferred for making lumber. The Multiple Use Plan for the area recommended that this grove be used as a living example of a hemlock old-growth forest, and recommended an interpretive sign program be developed. Krause Basin harbors some of the finest western hemlock forest on the Flathead. 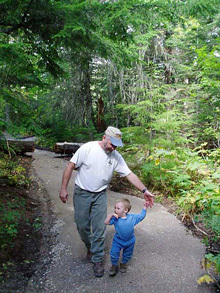 Swan View Coalition volunteered in 1997 to build and maintain an interpretive trail for the Forest Service, which then conducted a public environmental review of several locations in the western hemlock grove. The final location was selected to utilize an old log landing as a parking area and to utilize old log-skidding trails to minimize disturbance to soils and vegetation. Swan View Coalition volunteers invested over 400 person-hours developing the trail, including several workdays donated by the Montana Conservation Corps. The work was supervised by Swan Lake Ranger District according to a formal volunteer agreement. The writing of the trail guide brochure was a collaborative effort involving Swan View Coalition volunteers and Flathead National Forest staff, including a botanist and public education specialist. Numerous individuals and businesses donated or discounted labor, artwork, welding, gravel, dump trucks, heavy equipment, and other services to the project.